We have the perfect gift for any occasion! Contact the Studio to purchase one or more Art & Soul Gift Certificates today! 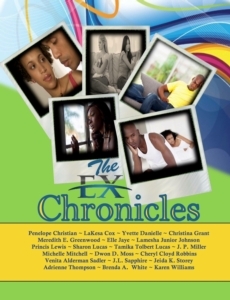 In The Ex Chronicles Anthology, Princis Lewis and 19 talented authors have come together to bring readers riveting, funny, dramatic, thought-provoking, and heart-warming short stories all about exes- breaking up, making up, or finally letting go. The Ex Chronicles is available for pre-orders!!! "Love is a powerful drug…whether it’s the love of family, friends, or that special someone who takes your breath away…chances are, you know the feeling. But what happens when it all goes wrong? Do you break up, then make up? Or do you just walk away?" In The Ex Chronicles, twenty talented writers share stories about relationships that falter…among spouses, lovers, family, and friends. Each riveting story reflects on broken bonds, bruised hearts, and open wounds - proving that all is fair in the battle of the exes.